I love it when I hear children ask naive questions like “Why do men have beards?”, “Why do birds fly?” or “Why is the sky blue?” As we grow up, I think we begin to lose that free questioning ability and start “knowing” everything. Now and then, I try to look at the world around me through the eyes of a child. bourncreative.com: White, an inherently positive color, is associated with purity, virginity, innocence, light, goodness, heaven, safety, brilliance, illumination, understanding, cleanliness, faith, beginnings, sterility, spirituality, possibility, humility, sincerity, protection, softness, and perfection. It fitted totally with my expectations. New beginnings and purity. But I did not stop with my research. 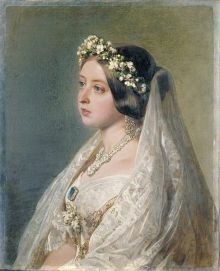 NYTimes.com: Queen Victoria’s decision to wear white when she married Prince Albert in 1840 set in motion a fashion revolution, quickly making that color the dominant choice among blushing brides. I had the answer to my question. Brides wear white because Queen Victoria wore white. Don’t always try to fit into the world you are living in, especially when you don’t know why you’re doing it. Sometimes it is good to have the world fit to you.